GateHouse Sober Community participates in the 12-step fellowships of Alcoholics Anonymous and Narcotics Anonymous starting with when they are in drug and alcohol rehab, and continuing thereafter to achieve long-term sobriety. Members of the Sober Community have sponsors and attend meetings regularly while taking personal time to work on steps with sponsors. We encourage a 12-step immersion program in GateHouse Treatment, a drug and alcohol rehab that many of our Sober Community members have completed. Often regarded as the most important step, and the “only step you have to get 100% right,” Step One is the step that we take when we have been given the gift of desperation admit to complete defeat. This can be difficult for most people. Step One in both fellowships of Alcoholics Anonymous and Narcotics Anonymous is about admitting you have a problem with using drugs and alcohol, and as a result your life has gotten out of hand. By admitting your problem, you are then able to seek out help you need to improve your quality of life. The first part of this two-part step is to admit that we are powerless over using drugs and alcohol. Powerlessness can present itself in a few different ways. For some of us, it means that once we have started to use substances, we cannot stop ourselves regardless of negative consequences we often face as a result of our using. Some of us are powerless in the sense that once we start using drugs and alcohol, we are unable to control how much we consume. We find that we have little to no ability to control ourselves or our decisions. The disease of wanting more and more takes over. We know that even with disappointing ourselves and our families, by losing employment, running into financial hardships, legal troubles and sometimes even serious health conditions as a result of our using, we are unable to control our using of drugs and alcohol. This is the true definition of powerlessness and at which point we must completely accept defeat. The second half of Step One is the result of our continue use of drugs and alcohol despite our lack of power over control our use. Unmanageability in our lives is often described in layman’s terms as “rock bottom.” Rock bottom, can be whenever you decide to stop digging. As the fellowships tell us, the eventual ends of our unmanageability are jails, institutions, and death. Unmanageability can present in our lives in so many different forms, it is sometimes difficult for “high-functioning” addicts and alcoholics to truly surrender to this part of the step. For some, there is no question our lives have become unmanageable. We have spent significant amount of time in jails or prisons, survived several overdoses and close calls, and have been homeless or in serious financial hardship as a result of our using. For others, we could still be holding on to work and have just enough money to pay the bills and put food on the table. Our consequences display differently. We might have strained relationships with our families and friends. We might feel the emotional unmanageability of using drugs and alcohol. Many of us can suffer from suicidal thoughts or depression, not valuing our own lives. With some deep reflection, our powerlessness and unmanageability will be evident to us. Whether we are ready to admit it or not, will be an important decision we have to make for our recovery. Our work on Step One begins the minute we enter the doors of the 12-step fellowships, but it is imperative to find a sponsor to lead you through the steps as suggested in the program of recovery. What would it mean to your life if you were to relapse and start using drugs and alcohol again? What will happen to your future goals and plans? Have you tried to stop using on your own before and failed? Have you tried limiting or controlling your use? How did that work for you? Its important to take suggestions from your sober support, your drug and alcohol rehab, fellowship meetings, but mainly follow the input of your sponsor on how to work the steps their way. This is the basis of the 12-step programs and ultimately following the guidance of your sponsor is what is going to get you sober. You cannot admit to complete powerlessness and unmanageability without having something to lean on and guide you. The only thing above your sponsors guidance is the guidance that comes from your higher power of your understanding. This brings us to Step Two. 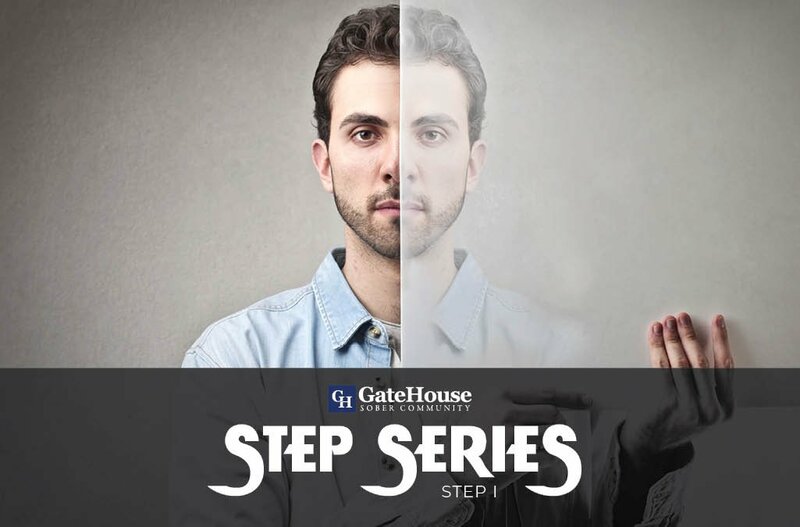 Be sure to come back next week for a discussion of Step Two to follow our step series on GateHouse Sober Community or follow us on our facebook page. If you have any questions about drug and alcohol rehab, be sure to contact GateHouse Treatment at 855-448-3588.